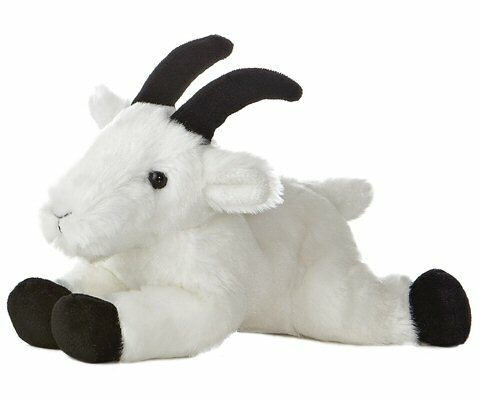 Rocky, this sweet little plush mountain goat is ready for hours of imaginative adventure with its soft white fur, black hooves, and majestic horns. Part of the Aurora World Mini Flopsies collection, this stuffed mountain goat has a cuddly understuffed body and sweet black eyes. Mountain Goat Fun Facts: Did you know that the climbing ability of a mountain goat puts most other animals and humans to shame? The hooves of this beautiful animal are cloven and have rough bottoms giving them amazing balance and grip. And you probably won't want to challenge them in a jumping contest as mountain goats can jump almost 12 feet in one jump! Male mountain goats are called billies, females are called nannies, and a whole group of mountain goats are called a herd. This adorable plush Black Face Sheep has fluffy cream "wool" and soft gray accents and can sit up, lie down, or stand.